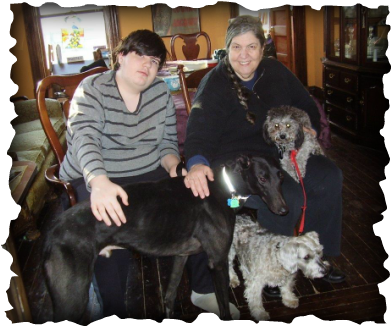 Big boy Mohican Sunrise (now Sammy) joined miniature poodle Harkness and Miniature Schnauzer Henry in his new home in Dayton. Susan and her grandson Paris did lots of research and made sure they were completely prepared to add Sammy to the mix. He now has a huge house in the Dayton historical district to explore and make his own. He and Henry became instant buddies and little guy Harkness is warming to his huge new family member. Sammy is going to be a happy, happy boy!